When BMW’s 5 Series is appealing but not quite potent enough, take things a step further with the 2015 BMW M5 midsize luxury performance sedan. This 5-seat super-commuter car is in its sixth generation and reflects Bimmer’s recent emphasis on providing posh and performance. This latest generation has added a slew of extra standard and available creature comforts to the M5’s recently standardized turbocharged V8 powerplant, while the available Competition Package adds even more ponies and posh. In other words, this isn’t your father’s V10-powered, old-technology M5. For the 2015 model year, a one-time-only 30th Anniversary Edition trim is slated to join the base M5. Only 30 of these benchmark iterations are scheduled for the U.S. market, and the first 29 folks who call a dedicated phone order line will get this up-powered version. The final 30th Anniversary Edition M5 is reserved for BMW’s demo stable, but should become available for sale towards the end of the upcoming model year. By the way, BMW proclaims the 30th Anniversary Edition will be the most powerful production sedan it has ever offered. In its most basic form, the rear-wheel-drive-only (RWD) 2015 M5 returns packing a 4.4-liter twin-turbocharged V8 engine. Once again, expect 560 hp and 502 lb-ft of torque from the force-fed V8 under the stewardship of either the standard 7-speed auto-manual transmission or an available 6-speed manual transmission that can replace the auto-manual at no extra cost. Furthermore, the 7-speed automatic comes with steering-wheel-mounted paddle shifters, while automatic engine stop/start technology and a torque-vectoring rear differential (Active M Control) remain standard with either transmission. One test had a stick-shift-toting M5 blasting from 0-60 in 4.5 seconds, with EPA mileage estimated at a respectable — though hardly overwhelming — 14 mpg city/20 highway. Selecting the available Competition Package for your M5 means upping the oomph factor to 575 hp with a few tweaks to turbocharger pressure and the engine control module, while further fiddling bumps the 30th Anniversary Edition’s power output to 600 hp and 516 lb-ft of torque. Of course, bearing the coveted M designation means this 4-door screamer additionally totes Bimmer’s track-proven, sport-tuned adaptable suspension and braking components, as well as standard M Driving Dynamics Control and, naturally, the standard M steering wheel. For standard appearance features, look for the 2015 M5 to tote 19-inch alloy wheels, a power sunroof, rear spoiler and heated power-adjustable, reverse-tilt mirrors once again. Trunk space remains 14 cubic feet, which is about average for the class. Inside, this plush potentate will return with standard premium leather upholstery, heated power-adjustable front seats, memory for driver’s settings and full power accessories, but that’s just for starters. Further standard interior goodies include cruise control, telescoping tilt-wheel steering, a remote garage door opener, front and rear parking sensors, a rear-view camera, auto-dimming rear-view mirror and dual-zone auto climate control. Of course, BMW Online, boasting MyInfo and smartphone apps, returns in the 2015 M5, as does Bimmer’s Bluetooth-interfaced iDrive infotainment system, which complements standard GPS navigation. Meantime, a 600-watt Harman Kardon premium stereo featuring a 6-CD changer, 16 speakers, a video monitor and auxiliary audio input is again the standard entertainment venue. Besides the optional Competition Package with its up-powered V8, sport exhaust and beefed-up suspension and steering, the 2015 base M5 can be delivered with an available Executive Package that adds a power-opening trunk lid (with foot-swipe sensors beneath), heated steering wheel, soft-close doors, 4-zone climate control, heated rear seats and ventilated front seats. Standalone options, meanwhile, include upgraded and up-sized wheels, rear-seat DVD entertainment, upgraded leather upholstery and a top-shelf Bang & Olufsen audio system. Furthermore, look for the limited-production M5 30th Anniversary Edition to boast not only more power, but also unique leather accents and upholstery, distinctive badges and a special Frozen Dark Silver exterior color. Finally, standard safety equipment aboard the 2015 M5 includes 4-wheel antilock brakes (ABS), front and rear head airbags, front side-mounted airbags and front knee bags, front head-restraint whiplash protection, daytime running lights, self-leveling high-intensity-discharge (HID) headlights and auto brake drying. A post-collision safety system also graces the M5 for the upcoming model year, as do BMW Assist emergency telematics and a remote antitheft alarm. Additionally, the optional Night Vision Technology system with pedestrian detection again remains an available safety feature, as does the Driver Assistance Plus package with top- and side-view cameras, lane-departure warnings and forward-collision mitigation. 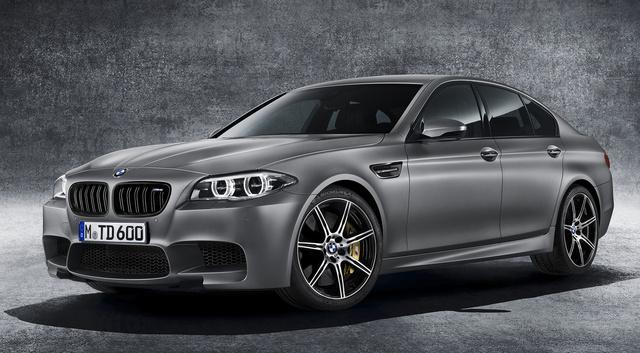 What's your take on the 2015 BMW M5? 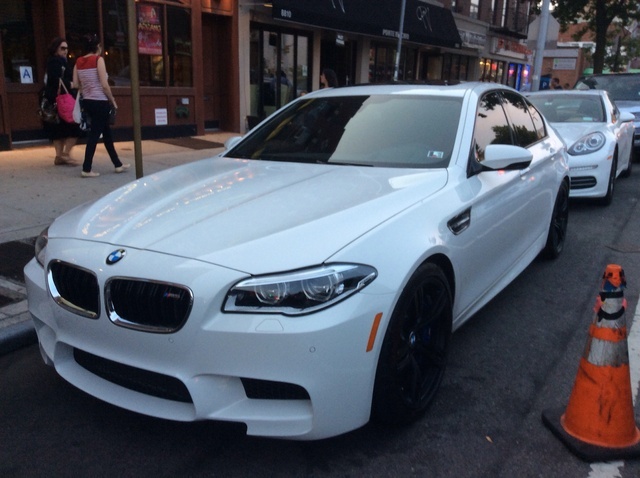 Have you driven a 2015 BMW M5? Just bought a BMW M5. It has an installed radar detection system. How do I shut it off or mute it?? It goes off of the time and is entirely frustrating. Please help!